GMC Navigation Antenna Active GPS NAV ANT GMC, GM, Chevrolet, Hummer, Cadillac,UM8. 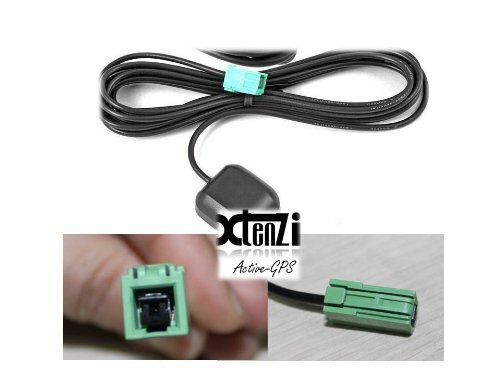 Replacement GPS antenna (Xtenzi Brand XTGP10-GMC) Specialy design to work with GM, SUV/Truck, navigation system antenna. This works on the GM, UM8, factory navigation system, except for the Corvette, Seville and Deville vehicles. Compatibility: GM, GMC, CHEVY, TAHOE, YUKON,Avalanche, Suburban, Denali, Sierra, Silverado, AND MORE. GM Ref Part Number: 15135178 / 15135435 2002 - 2008 Cadillac Escalade (including EXT) 2003 - 2008 Chevrolet Avalanche 2003 - 2008 Chevrolet Suburban 2003 - 2008 Chevrolet Tahoe 2006 - 2008 GMC Sierra (including EXT) 2003 - 2008 GMC Suburban 2002 - 2008 GMC Yukon 2001-2004 Chevrolet Trailblazer 2003 - 2007 Hummer H2 2002 - 2009 Chevrolet Truck (Fullsize) - 1500/2500/3500 in 2WD & 4WD 2001-2004 Envoy 2002/07 GMC Yukon XL Denali 2003/07 SSR 2002 - 2009 Cadillac Escalade, ESV & EXT 2002 - 2009 Chevrolet Avalanche 2002 - 2009 Chevrolet Silverado Truck 1500/2500/3500 2002 - 2009 Chevrolet Suburban 2002 - 2009 Chevrolet Tahoe 2002 - 2009 GMC Denali 2002 - 2009 GMC Sierra Truck 1500/2500/3500 2002 - 2009 GMC Suburban 2003 - 2008 GMC Yukon ----- The Magnetic base enables option to put GPS antenna outside car easily if required - Long cable gives opportunity to install antenna anywhere in car - even in hidden spaces, because reception is good always and you do not need to put it outside. • Brand New 5 Meters GPS Antenna Magnetic Base • GT5-1S HRS style Connection. • High power Active Gain for better signal reception. • Built-in Powerful Low Noise Amplifier Will also work with Following models and systems: Caution: This is one navigation magnetic GPS antenna will work a couple of different units. Look at the back of your unit so you will no if this will fit. THIS IS NOT A OEM PART, LOGO, PHOTO, OR COPY. THIS PART DID NOT COME FROM OEM (Like BMW-MBenz Ford), this was designed to work with different models as listed. Xtenzi High Gain External GPS antenna / aerial For GM, GMC, CHEVY, TAHOE, YUKON,Avalanche, Suburban, Denali, Sierra, Silverado, AND MORE.